The SKIPPY tremolo is based on the vintage Vox Repeat Percussion. The original VRP is well known for it’s very hard, percussive tremolo sound, or chop. Certain combinations of speed settings and playing style can almost trick your ears into thinking that you are playing through a delay instead of a tremolo. For these reasons, the sound of this tremolo effect is often described as synth-like. Originally, the VRP had only one control, Rate, to adjust the speed of the effect. In addition, the version that was built into the Vox Beatle Super Reverb amplifier also had an input jack for a foot pedal that enabled you to control the speed of the effect with your foot. CONTROLSDepth - Adjust effect depth from subtle throb to hard chop. Rate - Adjust effect speed. Level - Adjust output volume to compensate for perceived volume loss with certain extreme settings. Tone - Switch original Vox low-cut filter on or off. When on, output has a lot of treble and very little bass. Mode - Switch between hi and low speed ranges. Low speed is normal tremolo range. Hi speed is pseudo ring-modulator range. 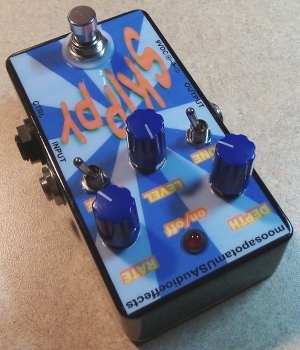 FEATURESPlug CV pedal into control jack to vary speed with foot while playing. Capable of ultra-wide range of speeds, up to pseudo ring-modulator speeds. 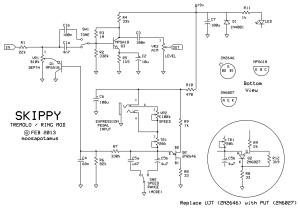 Accepts standard 9VDC, Boss-style, 2.1mm tip negative power plug. Modern true-bypass footswitch and LED status indicator. Hand made in USA using highest quality components available. Another feature implemented in the PCB layout is a universal PCB footprint for the transistor in the oscillator section. By changing the value of one resistor and adding one additional resistor, the modern 2N6027 programmable unijunction transistor (PUT) can be easily programmed to function exactly like the old 2N2646 unijunction transistor (UJT). 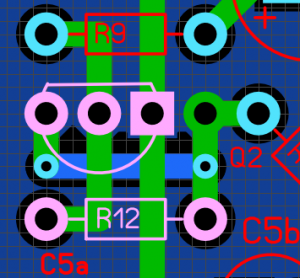 So the originally specified 2N2646 can easily be replaced with the modern 2N6027 without having to awkwardly bend the transistor leads around to achieve the proper pinout. 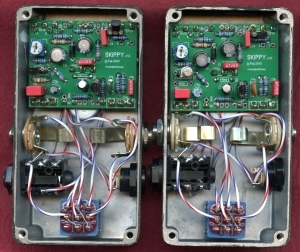 Here is an interior view of two SKIPPY pedals. The one on the left has a 2N6027 installed (as well as R12). The one on the right has a 2N2646 installed. 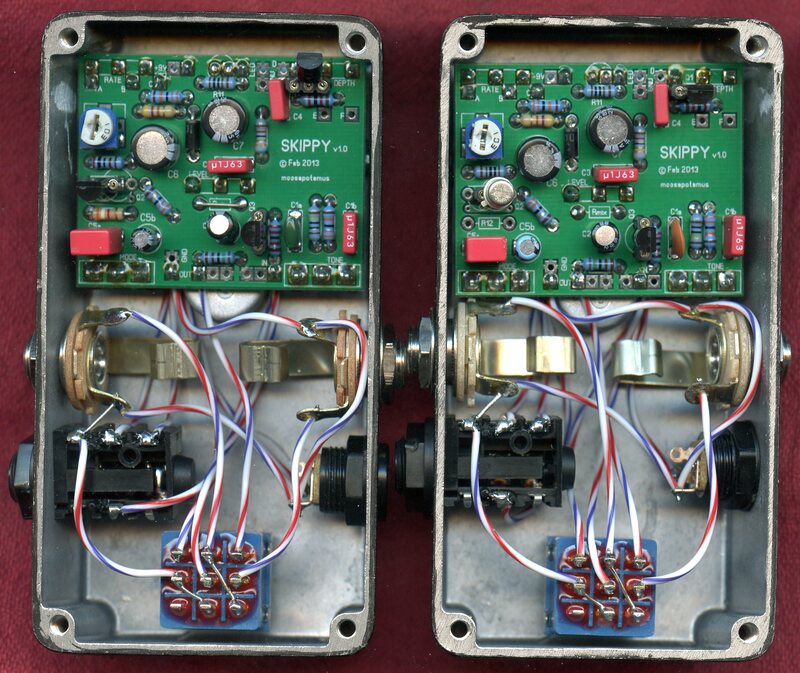 It is worth mentioning that the two pedals pictured above sound completely identical. There is no additional mojo to be had by using the outdated, sometimes expensive and hard-to-find 2N2646 UJT. The modern, affordable and readily available 2N6027 PUT works great and sounds perfect. 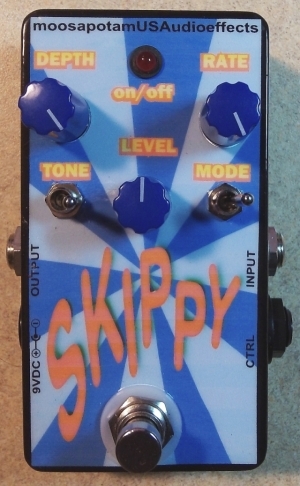 This entry was posted in Tremolo and tagged repeat percussion, skippy, tremolo by charlie. Bookmark the permalink. Rmix is an output mixing resistor (~10K). 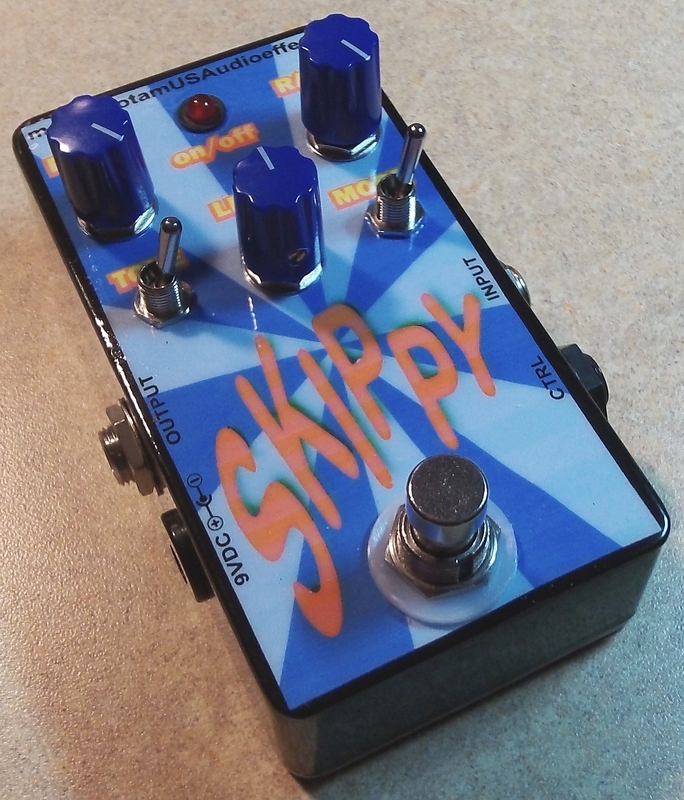 I added the footprint for Rmix to make it easy to combine two Skippy tremolo PCBs (or one Skippy and some other effect) into one enclosure to have a dual tremolo pedal. If you make two Skippys and populate Rmix on both boards with a 10K resistor, you can just wire the two outputs directly together. Otherwise, if you are just building a single Skippy, replace Rmix with a jumper. Good morning, I just finished building this and have to debug it. Would it be possible to send me what the voltages to the transistors should be? It looks like the board I got is laid out slightly different than what is shown on the instructions. I can not find Rmix. Where it’s pictured on the layouts I show R5. One last total newbe question here, I didn’t use brd mounted pots, do I still need to solder them from the front or can I solder them from the back and have the wires up top with the components. I can’t wait to get this up and running. I plan on installing the speed expression pedal jack and a stomp switch instead of a toggle for the mode to really let me tweak it on the fly! Thanks for you assistance. I’m assuming that you are using a 2N2646 UJT for the oscillator. I don’t currently have a unit built with a 2N6027 PUT to check. So here are the transistor voltages from one of my units. Yes, the layout has been updated to bring all the offboard wiring connections (except the LED) down to the bottom edge of the board. I just haven’t had a chance to make a new build document yet. But everything is labeled on the PCB, so it should be pretty easy to follow. And Rmix was removed from the new layout (so just ignore any mention of it). You can solder on whatever side of the board you like. Have fun! I appreciate you taking the time to share this, I enjoy reading more on this. Great Project, thanks for taking the time to do this, it’s awesome. The music demo is beast by the way, very slick. Is there a pcb drawing I can use to make my own pcb for the Skippy? Sure. Just follow the layout I posted to make your own PCB layout. At what dpi would i print it out? Thank you for your help. The only other time I made my own pcb, I printed the pcb on photo paper, etc. I don’t know what dpi, but as long as you size it so the pin spacing for the transistors is 0.1 inch, everything else should fall into place. Great project and really good sounding, I’m working in something similar, could you let me know what kind of signal comes from the oscillator? Is it a sine wave? does it have any DC with the wave? Thanks. The oscillator is more like a square wave – can be very choppy sounding. I don’t know for sure, but there probably is some DC. However, the way it’s configured, very little gets through to the audio signal path. A sine wave would give a very subtle tremolo. The Skippy is designed to give a very noticeable, more dramatic tremolo sound. I made a little proto yesterday with the two MPSA18 and a function generator in the depth pot, from signals bigger than 1 volt, the wave appears in the audio path, no matter with or without DC, I’m having good results with sine waves also, not so subtle, not so percusive. Hi, Mosapotamus. Can you help me, please? 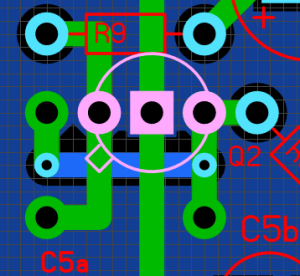 I can’t found the ground line in the PCB Circuit. Where is it? Is it a double layer PCB? Thanks from Spain for you colaboration. Yes, the ground plane is a separate layer. Look for the pads that have little bridges coming out (x shaped) to find the ones that connect to ground. A continuity tester will help, too. Is there documentation for v 1.1 somewhere that I missed? No, sorry for any confusion. The schematic is exactly the same. Only the PCB layout is slightly changed to move the off-board wiring all to one edge of the PCB. Everything is clearly marked on the actual PCB to make it very easy to figure out. Cheers! It is. and also a hell of a great deal easier to source than the trannies in the Vox repeat percussion and also it appears very remarkable! I like it enough that I constructed one despite the fact that I have a VRP. Hi,I’ve built a Hummingbird from the tagboard effects vero layout and it is nice, but if you send an overdriven signal into it (or if it’s just warm in the room), I get a crazy ticking on bypass. I’m told there’s some grounding tricks that can be done for the 2646 to solve this problem, but I am still fairly new to pedals and I’m a little reticent to cut up a working pedal! So, I wanted to see whether the ticking problem is also common for the Skippy with the PUT. I really want to put a tremolo pedal at the end of a signal chain, so that I can chop between high gain to nothing. Would this do the trick? Thanks for your time! I have not had any issues with ticking in the Skippy pedal. That said, there are a number of things besides the design of a given circuit that can cause ticking, most notably layout, wiring, and general construction. Doing things like keeping input and output wires well separated, and also as far as possible from any lfo control wires (i.e. speed, shape, etc.) can sometimes go a long way in silencing any ticking. 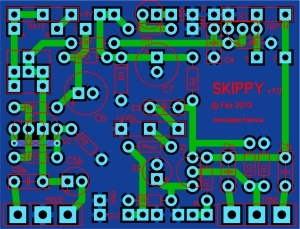 The PCB I designed for the Skippy has an internal ground plane. I’m not sure how much difference that makes, but I did it anyway. 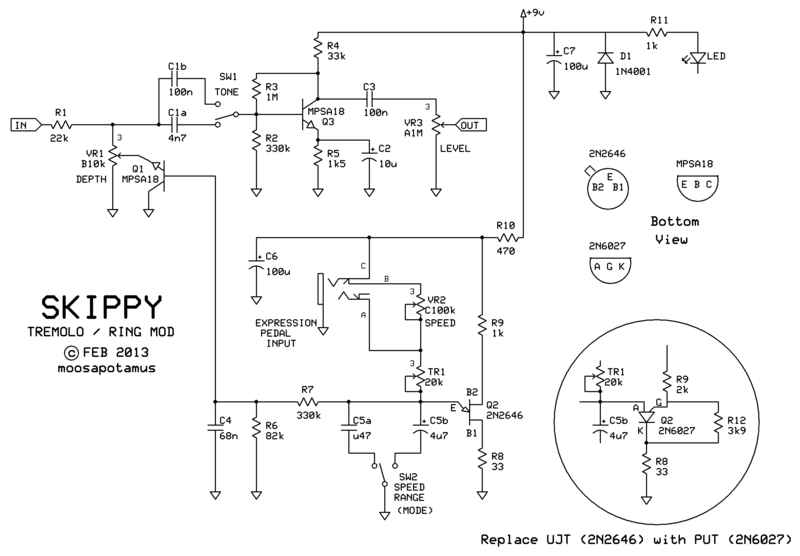 Silencing ticking in analog audio circuits is actually a pretty big subject. If it keeps cropping up for you, suggest doing some online research.